And now, the moment you've been waiting for. The very best cosplay we saw last weekend at Comic-Con. The people who bring the most joy to the Con floor are most definitely the cosplayers who wear their passions on their sleeves (and the rest of their bodies). Here are some of the most spectacular outfits. Many thanks to Phil Gould and Kevin Burrows, who took tons of amazing photos for us, and to Norman Chan, who graciously allowed us to repost photos from his gigantic cosplay gallery. And thank you to all the cosplayers who shared their feats of costuming wizardry with the world. Jill Pantozzi eating her horse heart out. Photo by Matt Sayles via The Bird and The Bat. 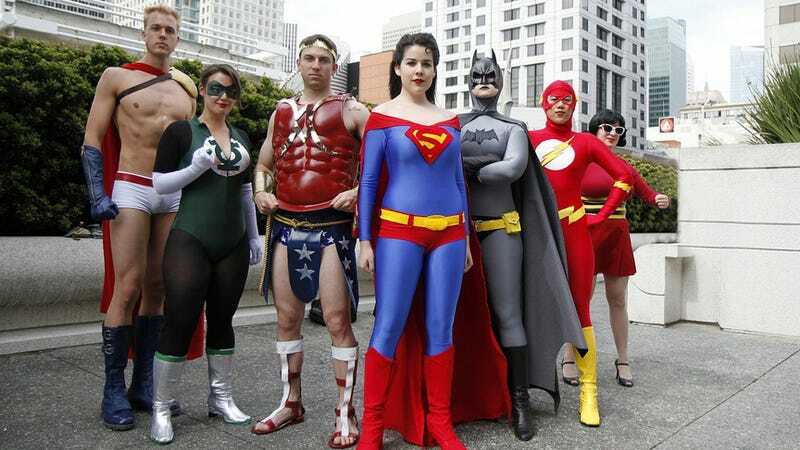 Gender Bent Justice League. Photo by Shannon Cottrell. See more at LA Weekly. This cosplayer did a dead-on Fluttershy voice and, when we spoke to her, never broke character.